Cold Steel 1815 French Officer's Saber(88NF) Sharp medieval swords, two handed sword, viking sword, hand and half sword and others. The army of Napoleon was celebrated for its organization; despite the countless variations in uniforms and equipment. While the rank and file soldier was issued the standard accoutrements of the day, the officer's ranks were composed of a somewhat vainglorious lot who sought ways to distinguish themselves in both dress and in the styling of their weaponry. Huge numbers of differently styled edged weapons were issued and some were even custom made to order. Among the best examples of these special sabers was one forged for Lancer Officers. It was beautifully balanced and offered a moderately curved blade, a sharp useful point, and an excellent three bar hilt. As a cavalry weapon, it was more than suitable for use in a charge and performed equally well when fighting at close range in the mêlée. It was, however, the striking appearance of this saber that really inspired us. 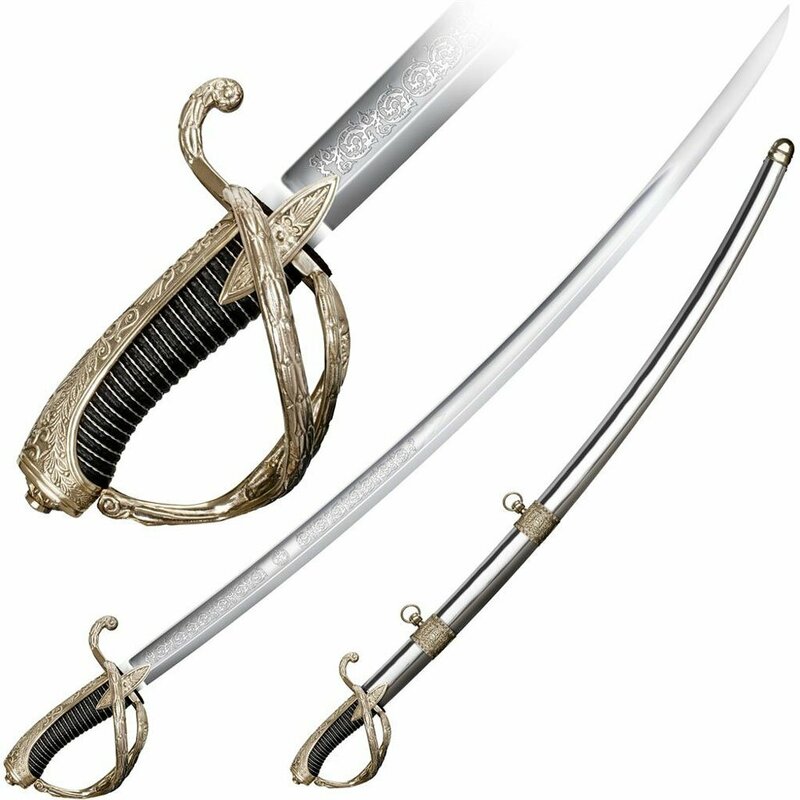 From the highly polished steel and elegant etching on the blade, to the intricately decorated solid brass furniture and hilt, it's truly a vision to behold.